$255.00 & FREE Shipping on orders over $59. 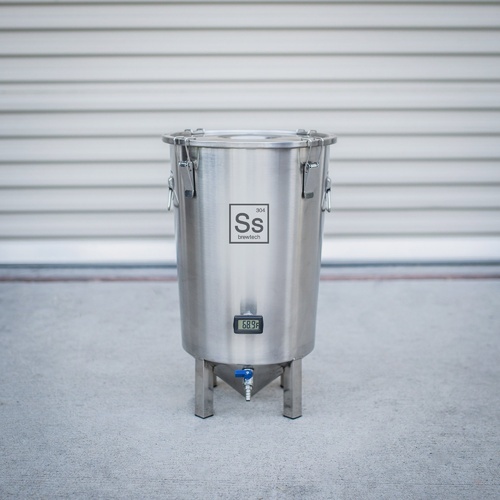 The guys over at Ss Brewing Technologies took what was already a really cool product and just made it a lot better for just a little more money than the original Brew Bucket. Introducing the Brewmaster Bucket! By popular demand, they've now added a very nice weldless thermowell and LCD thermometer. So now you can get your temp readings right off your Bucket without having to mess around with tacky, temporary thermometers! 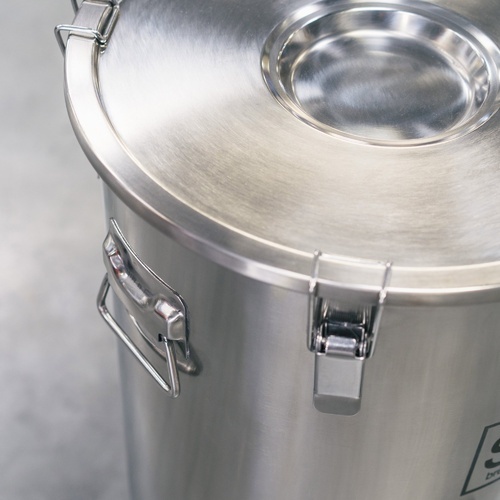 What really sets Ss Brewing Technologies Brewmaster Bucket apart from other fermenters is that it has a conical bottom that allows trub to settle out in a concentrated space that minimizes the surface area of the trub that is in contact with your beer. 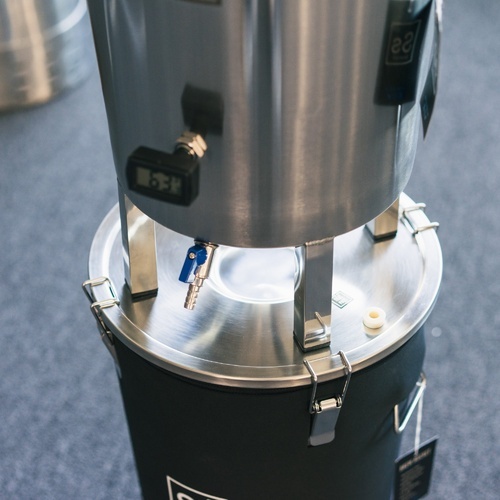 The included Patent Pending Rotating Racking Valve allows you to rotate the racking arm inside the fermentor down during fermentation to minimize trub, after fermentation is complete, simply rotate the racking arm up to get nothing but crystal clear beer. Etched Volume Markers on the inside come in handy when filling. As with the Brew Bucket, the build quality is really amazing for the price. The welds are clean. The lid is strong and the spring loaded lid hatches are solid. The lid includes a removable, molded silicone gasket that ensures an airtight seal. We love an airtight seal so that we can be sure to see the airlock working. 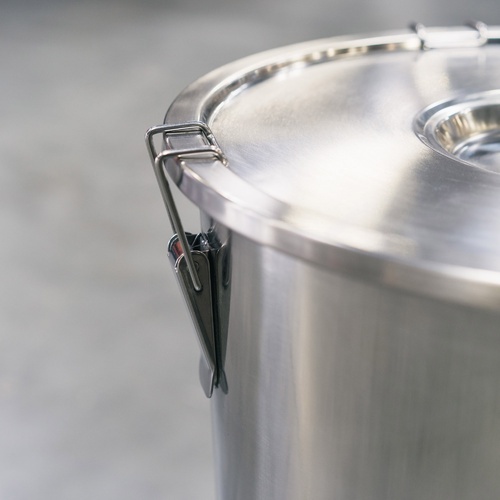 The welded on stainless handles make the Brewmaster Bucket fermentor easy to move. Husband has one, in the lesser model, needs another. Its a christmas gift . Thought I'd step it up a notch! Looking to upgrade my setup without breaking the bank. Looks like a great quality setup looking forward to brewing with it. 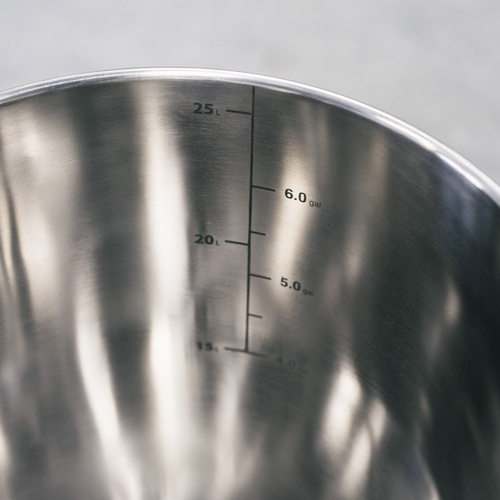 Love stainless steel and the digital thermometer. So much easier to clean than a plastic bucket, and I love being able to take a sample without introducing oxygen. I already own one and want to brew some 10 gal batches. Great product. Stainless with a thermowell and best rated below a conical. Upgrading my fermenters & Ss Brewtech makes quality products. Head and shoulders above the plastic one I have now. Can one lift this product using the handles provided while it is filled with 6 gallons of liquid? I am small-framed and 5'2" tall. I lift six gallons with no concerns about the structural integrity of the Brew Bucket. This is a sturdy product that I use for beer, cider and mead fermentation. Is the thermowell large enough for temp probes like those of the Inkbird controllers? 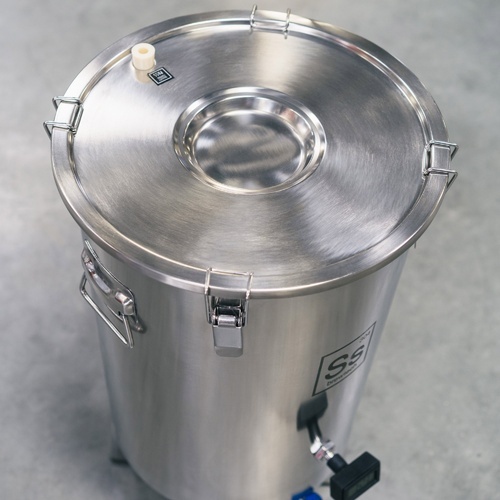 BEST ANSWER: I have the InkBird FE461, and the Ss BrewTech 14 gallon BrewMaster Brew Bucket. The InkBird temp probe fits just fine, though you may actually want some mechanism to make sure the temp probe stays in place and does not accidentally get pulled out (painters tape will work just fine). Yes, I have the inkbird probe I have inserted into the Thermo weld and it works great for cool and heat inside a small refrigerator. I don't know the size of the Inkbird probes, but I use a STC-1000+ with a probe and it fits just fine. How tall is it with airlock on ? BEST ANSWER: The height with a three piece airlock is approximately 25-26", but using the bubbler style airlock with the side by side chambers total height is approximately 27-28". The lower side of the range takes a little force to achieve. BEST ANSWER: I measured the lid on my brew bucket and it was .043" so it looks like 18 ga. I went from plastic buckets to the Brew Bucket and couldn't be happier. I use the thermowell for my fermentation chamber's temperature probe and I am able to precisely control the temperature of fermentation. 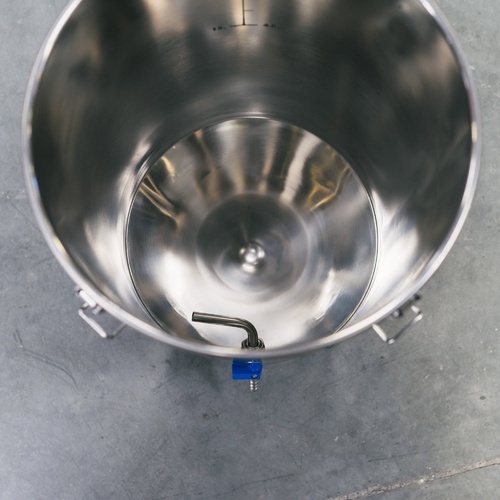 The Brew Bucket is easy to clean and sanitize and the racking arm makes pulling samples and packaging a snap. After using carboys for years to finally make the change to stainless was huge. This product is a pleasure to use and for the price the features it comes with are a great value. Well worth the investment. After switching to SS from a plastic bucket, I'm sold. Absolutely love the digital thermometer and having the ability to take a sample for gravity readings and tasting without having to pop the top. For anyone looking to make the switch, make the switch. Just make sure you set the racking arm to 3 or 9 o clock, not straight up. We had blockage the first time we fermented, but it was our own fault. Love this bucket and highly recommend it! The brew bucket is a quality product. I own 3 and would buy another if I felt I would keep it filled. The design is simple compact and its stackable. All in all great product for any home brewer. This is a well built stainless steel fermenter. I love the thermometer on this one, it keeps better track of the temp during fermentation than a sticker on the outside. I moved to the SS conical bottom from Big Mouth Bubbler. This works great and is much easier to clean. I fitted it with a blow off tube and a temp probe form my brewpi. I brewed my first lager and figured that was a good excuse to finally get one of these. So far, it's everything I expected. I don't use the thermometer that comes with it. Instead, I use the thermowell for the probe on my temperature controller. I would recommend this to anyone looking to control fermentation more. I've been contemplating buying one of these for a while! Absolutely love it so far! Awesome piece of equipment. Well worth the money! I wanted to be able to do 10 gallon batches so I bought another Brewmaster Edition fermenter. Definitely worth the extra money for the thermowell and sensor. Very well made and easy to use. I especially like the silicone lid seal. Love this thing! transferred into a carboy for secondary and am now thinking about getting another one for secondary. Was skeptical after reading reviews about the leaky spigot. But I used Teflon tape on the threads, per the instructions, and didn’t over tighten the nut, and it works fine. The stainless speaks for itself. Craftsmanship is worth the price. I’m going to buy another one. Excellent fermenter for a great price! Super fast shipping! Thanks MoreBeer!! Terrific fermenter. Transfers are so much easier. Now I need a 5 gallon version as a secondary. Very happy and pleased with new fermenter, easy to set up and use,. Like the thermators and the ability to know beer temp. Most features in a brewbucket. 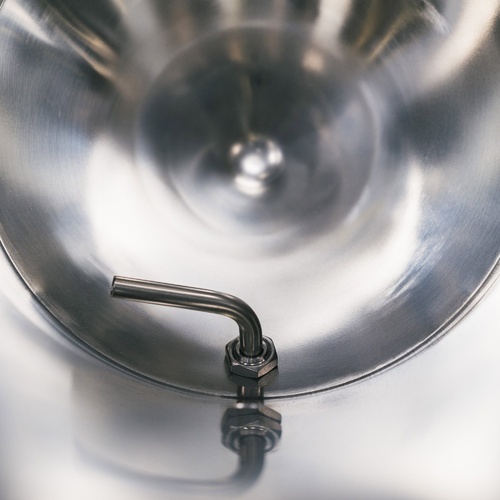 It’s a one stop shop and prevents from potential contamination during a transfer to a carboy. I also got the brewmaster edition which works great for lagering. The fact that these are stackable is great as it reduces the overall footprint. I have purchased 2 of them. Works good. The only issue is the Dip tube does not rotate with the outside handle I have to reach inside when the beer is low enough to turn it down. Much easier to check the gravity with spout. Super high quality fermenter. Easy to clean, and makes transfers much easier. The Brewmaster is a great fermentor, I really utilize thermometer. I would highly recommend. I'm going to purchase my third one, so that I can do 15 gallon batches. I have used this item for several batches (4),. I have been attaching a blowoff tube (1/2" silicone tubing) to the opening in the fermenter and running the CO2 into the keg to purge it, and it has been great. Transfers are simple, just hook onto the hose barb and open the valve to drain into the keg...what could be easier. But really, it has been pretty good. I clean it on a Mark II keg and carboy cleaner and it fits fine. A bit of PBW and hot water and after 20 minutes the thing is sparkling. The rotatable racking arm is fine, but I don't tend to use it. If the nut is too tight on the fitting then the o-ring can get bound up and cause a major leak. I tend to just leave the racking arm in a single position pointed to the side and that is that. I harvest the yeast after transferring to a keg by swirling things up and running out the material through the valve into a mason jar (or two). Works just fine, no complaints. I have used glass carboys, Big Mouth Bubblers, a Fast Ferment Conical (1st gen), and this i by a good margin the best one. Taking samples is simple with the valve. A few mL and you can get a good refractometer sample out of it. Easy to carry/move around. The handles and feet seem pretty sturdy so I'm not concerned with that. The thermowell fits the probe from my STC-1000, but only just. Tight fit, but I guess that isn't a bad thing. I've had some problems with it leaking from the spigot. I replaced the inside O-ring with a teflon washer and it seems to do the trick. It's a little more difficult to rotate but still functional for re-positioning the racking arm. The OD= 1", ID= 5/8" and thickness 1/16". Bought the teflon washers off EBay for $3.50 a piece. The 5/8 " ID is a little tight and had to screw it on in order to get the nut started. You could probably use 220 grit or even better 400 grit sandpaper to modify the washer to make it easier to get off and on. I use a 7/8" deep socket on the inside nut so I don't scratch the fermenter. Great product! I am glad I bought the Brewmaster version because I love the thermalwell and included temp indicator. I will probably buy a second one for the occasional 10 gallon batch. It works great. I use it as a primary fermenter only. I didn't appreciate having to clean it with a special cleaner before I could use it. TSP isn't expensive but it is harmful to the environment and I don't like using caustic substances. I have other stainless steel equipment by another manufacturer which didn't require special cleaning. The o-ring gaskets get displaced if you tighten them too much, I only hand tighten them now. I've used the fermenter several times now and the last time I had no leakage. Because of the type of gasket being used the spigot is not solidly attached to the bucket. It allows for the "feature" of re-positioning the rack arm. I'll be looking to replace them with teflon food grade flat washers and hopefully still be able to rotate the spigot. The Thermowell, you need it. I use warm water and my hand to clean the fermenter, that's just how easy it is to clean. You don't have to use a cleaner. I do wipe it out with a soft sponge that has some Dawn dish soap in it and rinse thoroughly. 4 stars only because of having to clean it, otherwise 4.5 stars because of the o-rings. 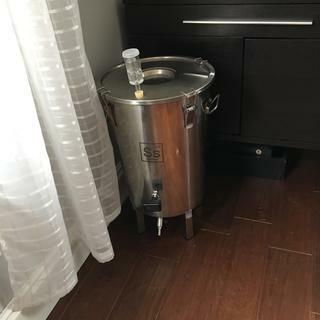 I really like this fermenter and would recommend it. 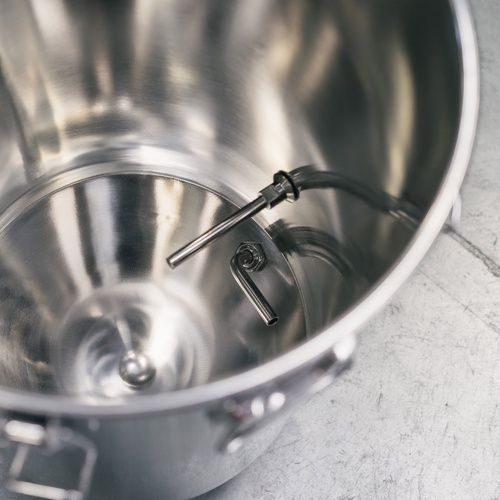 It's time to re-purpose your fermenting bucket and start brewing better beer. I haven't had any leak issues other people mentioned. I rotate the spigot all the time. It's steep price wise but an amazing product. ThI bottom isn't too big but I've never had trub that didn't fit inside. My wife bought me a brew bucket for xmas 2016. When I received my bonus from work in March I bought a second one. The only con is the legs could be a little longer (like 4") to make getting a sample easier when the bucket is sitting on the floor and not a ledge of some sort. Otherwise I absolutely love my brew buckets. 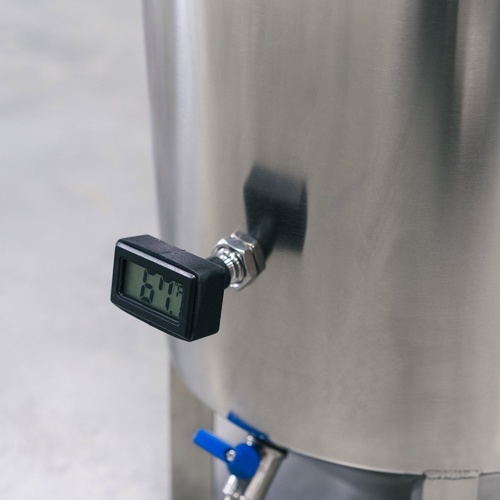 The sanitary valve on the fermentor reduces oxygen during transfer to a keg if you use a hose with an output post, purge the keg with co2 and open the vent to transfer from the bottom up. Fantastic. Leaky spigot. Didn't work for me. The spigot isn't designed as well as it could have been, in my opinion. I was unable to keep the spigot from leaking while disturbing it at all, such as when attaching tubing, opening the valve, or rotating to reposition the racking arm. I consulted Morebeer support and they were helpful in offering suggestions such as different nut tension, keg lube, etc. Nothing worked. Any time you turn the spigot, it caused the inner o-ring to squeeze out from behind the nut and caused a leak. Since a leaking fermenter isn't something I care to use, I sent this back. Support was excellent with a no-questions-asked money back return. It's too bad they didn't design a more reliable sealing system into the spigot. I wanted to brew a dozen batches before giving a review. Overall I am very happy with my expensive fermenter. Thermowell gives my thermostat probe the perfect home. The spigot has always leaked a bit if I try to rotate it as shown on the SSbrewtech website. The conical bottom does not hold much. 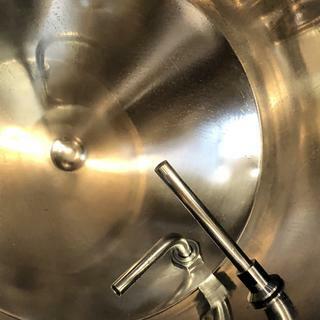 If you want to use this as a single stage fermenter you will want to remove 95% of the trub and spent hops from your wort before putting it into this fermenter, otherwise the conical area will fill up with gunk quickly and you will have cloudy beer going into your bottling bucket or keg. I now use this as a primary fermenter and rack to a second container for the last 20% of fermentation and then cold crash. First, it's a work of art! I planned on trying to hide the fact that I has spent over $200 on a fermenter from my wife but it was just too cool! I had to show her. Second, I did follow the instructions for cleaning which were pretty thorough. The hardest part has walking around home depot searching for the TSP it called for using on the initial cleaning. I ended up finding it in the paint aisle after looking in the cleaner aisle for a while. 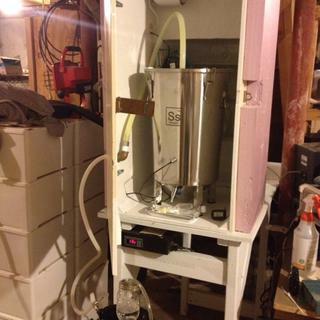 I use the Brew Bucket inside a small temperature controller refrigerator and it has made all the difference in being able to tell the true temperature of the fermenting beer. I was able to dial in my exact fermentation temperature by adjusting my controller and checking the temperature over the first 48 hours of fermentation. I also found it very useful to determine if my wort was cooled to my exact pitching temperature as it was coming in from my chiller. It was a little warm so I popped it in the fridge and waited until my yeast could call it home. The batch of centennial IPA I made in it fermented very clean and is a big hit. It cleaned up very easily with PBW after fermentation. The big difference for me is that I filled a keg with sanitizer and then pushed the sanitizer out with CO2. I hooked a hose up to a black ball lock connector and filled my keg from the bottom without using a siphon. This is the biggest change in beer quality for me. I've been brewing for 8+ years and I've never been happy with siphons. They are hard to clean and always seem to introduce oxygen which starts to oxidize the beer. 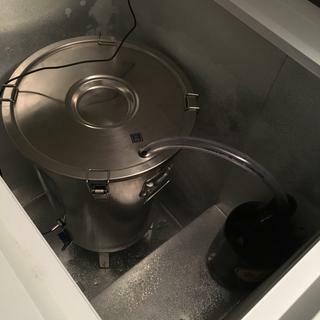 With the Brew Bucket I have more temperature control, less oxygenation and easier cleanup. I love it! 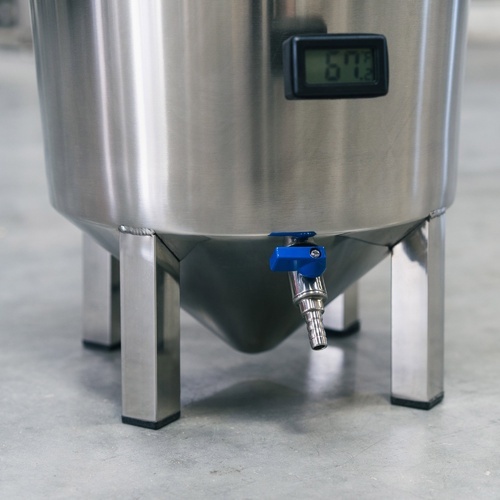 As another reviewer has said, it's important to clean this fermenter (and any other stainless brewing equipment) well before you use it - as there may be oil and residue present from manufacturing that will affect your beer. Once you've done that, it's smooth sailing. Assembly of the valve and thermowell was easy. The lid latches on tight and makes a good seal. I've used it both with airlocks and blow-off tubing and have had good results with both. The conical bottom does a nice job capturing sediment and yeast at the end of fermentation. My biggest regret here is that there's no way to extract the yeast for possible re-use later. Some of the more expensive stainless fermenters have that option. The straw-like tube on the valve is a great addition, helping you draw as much beer as possible from the fermenter for bottling or kegging while avoiding much of the trub at the bottom. Cleanup is easy. A little PBW and hot water and it looks like new inside. Since it's stainless, there's no aroma (or stains) left over after cleanup to possibly affect the next beer. I prefer my plastic buckets for bottling, but I plan to get another of these for fermentation needs in the future. I'm very impressed with the quality, ease of use, and cleanup. For the price, you can't beat it. 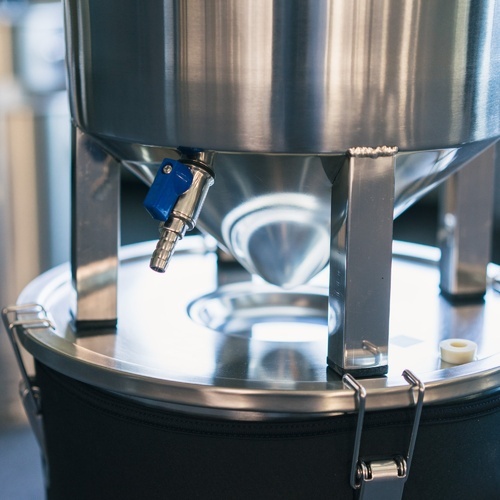 This is superbly made fermenter and - heavy duty, well-assembled and well-designed. The price is hard to believe for both the quality and the features (thermometer, etc.). I'd absolutely buy again. Tip: be sure to wash the fermenter very thoroughly and consistent with the directions provided.